Cam (Instagram: The Disc Golf Donkeys) reached out to me back in September and we did a little virtual coaching and then he jumped head deep into fixing his form, getting out to some big tournaments and now... back to more form work and we're going to jump right in. 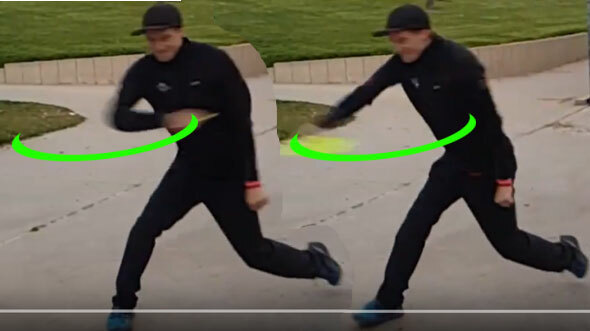 Okay, screen cap 1 is telling on a few fronts: so this is the spot in the timing where disc has initiated coming forward from the top of the backswing. 1. Blue line: the upper arm has collapsed because you're already too open. Simon is throwing off the left side of this teepad, but still - same spot in the timing, he's initiated the disc forward - but his shoulders are squared up perpendicular to this trajectory. Simon, Eagle, most top level guys are going to let the eyes stay with the disc, where you're trying to lead the shoulders with the head. 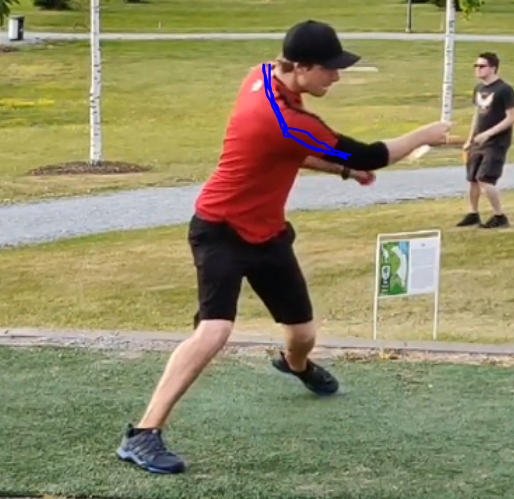 There's another issue that needs to be addressed: Not only do you need to get onto the frontside earlier, you need to shift so that the back leg tracks forward. This side-by-side is specifically what I mean when I say "catch and resist the forward momentum". 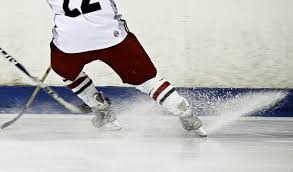 You have to settle onto the front side, with the plant leg angled to resist your forward shift. The by-product of resisting the momentum, is that your backside (trailing leg) is going to shift forward. 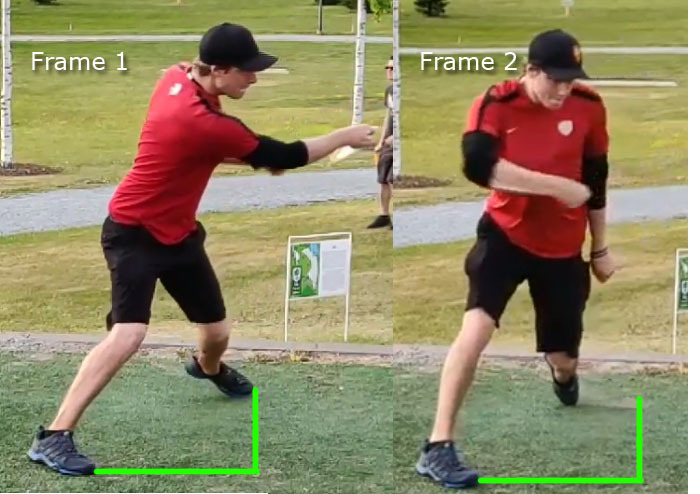 Look how far forward Simon's back foot has tracked forward between frame 1 and frame 2. That's damn near a foot of tracking forward from the top of the backswing to the disc being at the center chest. So here we see the byproduct of missing out on the resistance. 1. Angle: the plant leg has to be angled so that you don't blow past. Hockey players learn this trick early on, when they need to do a "hockey stop" and/or throw a spray of ice at their little sister. 2. Come in with the hips closed. 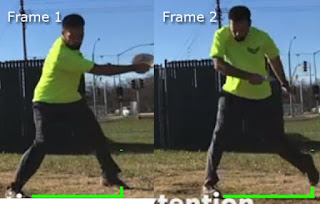 (Simon frame 1) offset /staggered feet for the plant step will make this move easier. 3. Slow down. There is NOTHING about a backhand form fix that improves when you are tryingto do it faster. I want you to do the following: please humor me on this, I know it's a little wacky... I want you to close your eyes and visualize that you are handed a track and field hammer. I want you to visualize what has to happen in order for you to throw it. Play the internal visualization over and over from multiple angles and watch and feel what your body would need to do in order to accelerate the hammer. This may take 5-10 minutes to really focus on how you redirect it forward, what direction do you shift to throw the hammer along your line, how do you resist the momentum of the swinging hammer? Where does your weight need to be on your plant leg? This type of mental visualization is really helpful when you're making the jump from amateur disc golf swing to high level professional disc golf swing. Not only do you have to drill, throw, fieldwork, video review... but you can benefit greatly by mentally inspecting the broad goals of the motion. What are we ultimately doing? Why do these motions have to happen? What happens when we take multiple systems and link them together? Lastly, and you'll just have to trust me on this one, if you work on the stuff mentioned above, this will get easier - you are initiating the disc extension well before you've got the disc loaded into the center chest. And this part is hard, because every bone in our bodies has told us from day ONE that to throw something fast/hard/far - you've got to "put everything you've got into it!" 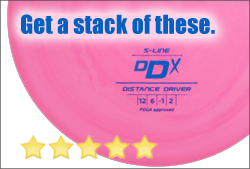 and in disc golf, that's just patently false. You've got to WAIT, stay loose and let the disc and your lower body collect the momentum and then transfer your momentum into the disc, in a very specific place. I call it loading the cannon. Simon shows us exactly where the canon track is: it starts at the center chest with the hand on the outside of the disc and the arm levers swing open, extending forward. That's the most effective track that you can load your momentum into - and if you start "pulling" too soon, you'll likely never end up on the track. You've got to wait and use the body's momentum, not your arm's muscles. By-Product of using your arm: leading shoulder raises up (Your Frame-2). By-Product of using your body's momentum, leading shoulder stays nice and even (Simon's Frame 2) which is a little hard to see in the black jacket. Using the extension track in the right place is MORE EFFICIENT even moving slowly, than pulling hard with muscles and not getting into the right track. Long time, eh?! I've been a lazy blogger, but I do on occasion post on Youtube and Instagram (loopghost on both platforms). I got an email from Lykke Sandvik and she had an idea... hey, let's have her say it. I’m a 26 year old girl from Norway, I started playing last summer and totally I’m hooked. It’s been a really good first year and first season for me. 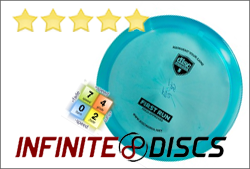 I committed to disc golf almost right away and I decided fast that I’m gonna be a Pro and be one of the best girls out there. I’m 862 rated after my first season, and even tho that’s good I still feel I could’ve been close to 900. The lack of experience and mental game has been the biggest issue for me. But this is something I’m working on and I have a lot of experience from other sports and mental training, I love competing and I always go all in. This is my first off-season and I’m working on a training plan for the next 15 week. I own a shop in my hometown with some guys and the last couple of weeks we have worked on a practice room for us to use this winter. We now have a room with 3 baskets and a driving range with net. I can do putts uptil 10m on all the baskets. I’ve been talking to some Pro’s about my training and my form, and I’ve gotten alot of help the last months. But I still feel like I don’t have everything I need to get myself to where I want to be in 2019. Pro’s don’t always know’s best and they don’t have time (or knowledge) to coach me through out the off-season. The idea is pretty simple: what would your throw look like if I said, instead of throwing a disc - I handed you a basketball and said "throw this underhanded with both hands"? using your x-step. I want you to post up on your front side: meaning that you should be shifted onto your front hip and braced against it so that if stood behind you and pushed against your back hip towards the target, you'd be able to resist me. What would that mental experiment generate in your mind? Would your left hip be freely gliding past the brace? Would you be stepping through the brace at all? What is the difference between using both arms/hands in our underhanded basketball throw, and using just one arm (the leading arm)? I think the easiest way to start these blog posts is to just have a conversation and include any videos you want, any conversations you want to have and I can respond in video and in text. 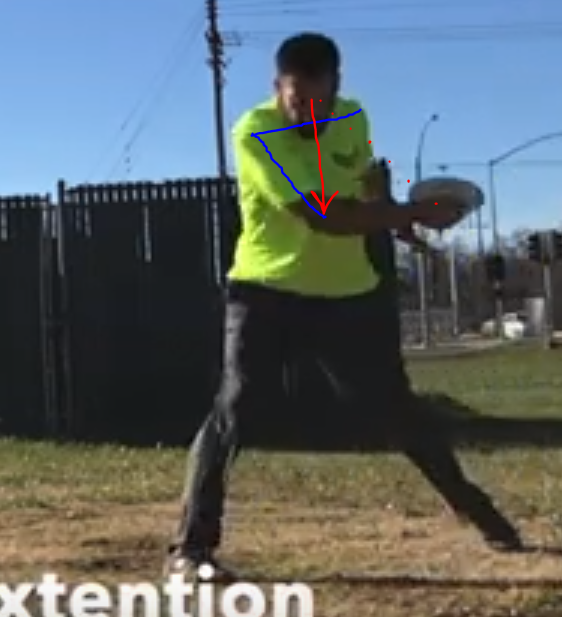 Developing world class form (for most people including me) involved really contemplating what is happening with your body when you're throwing. 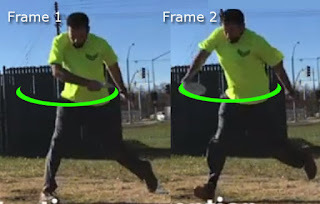 Understanding why things need to be done a certain way will help drastically with a swing change. I asked quite a few tough questions, and I wanted to really dig into what Lykke would come up - as they aren't easy questions. You have to physically try things to start feeling what happens. Lykke Responds: So I did some shots with a basketball and this is my thoughts: I use my core to get the power, when I reach back I feel like I have the ball in front of me the whole time (Absolutely no rounding when i throw), It feels weird to throw with both hands - I feel like I only use my hips and core to throw it. If you stood behind me and pushed I would definitely have my leg straight, that`s the first that pops into my mind. I think this one is hard to answer because I don`t really get what you mean by this: "Would your left hip be freely gliding past the brace? Would you be stepping through the brace at all?" You have a video of this or is it more for me to think about it? 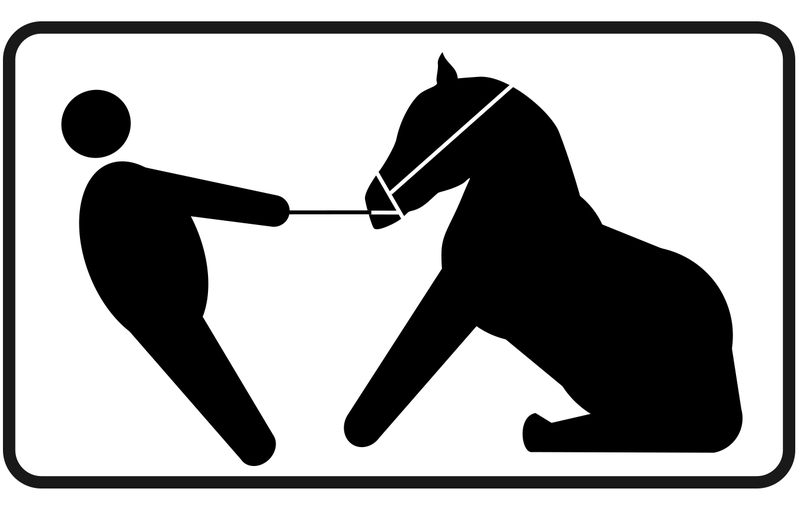 Is the idea that I`m suppose to throw when you`re pushing me "through" the brace? The first thing that pops into my head is that I have to resist you and then use that power when you "release" me to generate power into my drive. Difference between one arm and both hands: I feel more free, but with a basketball I think it`s harder to throw with just one arm (if I had to throw with my right arm), throwing with my left arm feels easier because I feel like my power is in my left hip and when I`m turning to release it I have the ball against the target. When that is said I don`t feel like it`s a huge difference, I still feel like the power is in my hips and core. The biggest difference is the control I have over the ball. Okay, so we're getting somewhere and that's wonderful! I like that Lykke got to the key concept of "resistance" and why it's so important. All of the concepts have been addressed in this video that I made in my not-so-man-cave basement. Listen, I'm just an old-timer with a tiny dog and my daughter loves Legos and dolls!